Just as salt can enhance almost any dessert, adding a little heat to your sweets can intensify the flavor and make your candies taste more complex and interesting. This doesn't mean you have to dump a whole bottle of cayenne powder in your fudge--just a pinch of spice here or there can mean the difference between bland and grand! 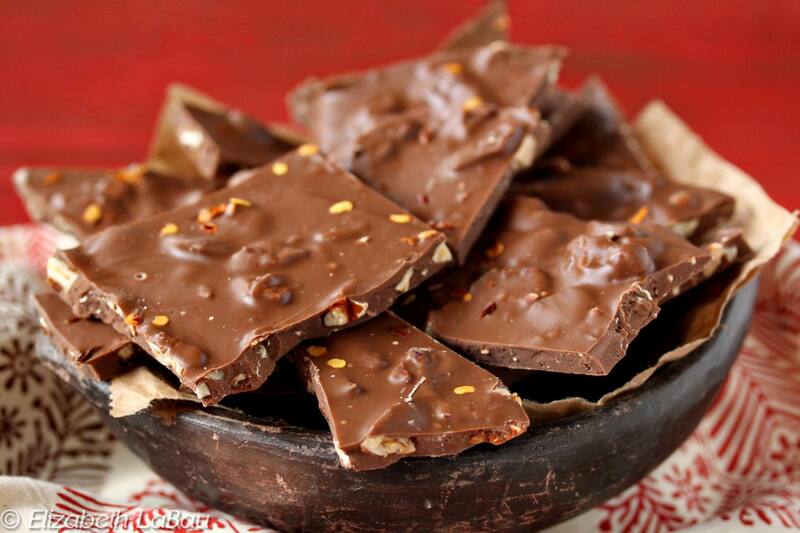 Spicy chocolate bark is one of my favorite ways to introduce friends to the pleasures of spicy candies. It's made with sweet milk chocolate, candied pecans, and a pinch of cayenne, so there's plenty of sugar to smooth out the edges of the spice. Sensitive to spice? Omit it entirely and add cinnamon or ginger instead! Love to heat things up? Double the cayenne and feel the burn! Follow the arrow to the next slide to see more spicy candy recipes. The ancient Aztecs loved to prepare their chocolate by grinding it into a thick paste and adding cinnamon and red pepper, which sounds just about perfect to me. (Now, they also liked to drink it unsweetened, and I think that's a bridge too far.) But the basic concept of adding cinnamon and spice to chocolate is a good one, so I've taken that flavor combination, added a bit of orange zest as well, and created these Aztec truffles. They're fruity and flavorful, with just the right amount of heat. This is, hands down, one of my most popular party recipes. I've been making them for years and people always beg for the recipe! These Sweet and spicy candied pecans are amazingly versatile: eat them plain, chop them up and put them on top of cakes or cupcakes, or use them in savory dishes like salads and rice pilaf. They're tangy and sweet, with a little kick from cayenne. You won't be able to resist them! Mexican chocolate fudge features cinnamon and a hint of spice in a smooth chocolate fudge, topped by crushed Mexican chocolate. If you're not familiar with Mexican chocolate, it's sold in blocks and has an unusual grainy texture that adds a wonderful crunch to this easy fudge. One of my favorite summertime treats is to cut up a bunch of melon and mango, and sprinkle it with lime juice, a bit of salt, and a pinch of pepper. It's so refreshing and so delicious! Using that recipe as my inspiration, I created this Chocolate-dipped mango recipe. Flavorful dried mango is coated in bittersweet chocolate and dusted with spicy cayenne in this simple, delicious candy. The combination of sweet and chewy fruit, rich chocolate, and a touch of heat is fabulous. After trying these cinnamon truffles, you'll never want to eat regular truffles again! All it takes is a few cinnamon sticks infused in the cream to give these rich chocolate truffles a deep cinnamon flavor. Spice up your regular peanut brittle by trying this recipe instead! Spicy peanut brittle improves upon the candy classic by adding a modern element--smoky, spicy chipotle chili powder. The resulting candy is crunchy, nutty, sweet, spicy, and incredibly addicting.